It is OK to use your textbook or lecture notes from class, but if you can answers the questions without it that is OK too. Do not press the RETURN or ENTER key while you are answering these questions. Your browser will interpret either the same as clicking on the Submit key. Answer all of the questions below. If you do not know an answer enter CNA. However, it will help me the most if you answer each question with your best intuition/idea about what would be a reasonable answer. 1. 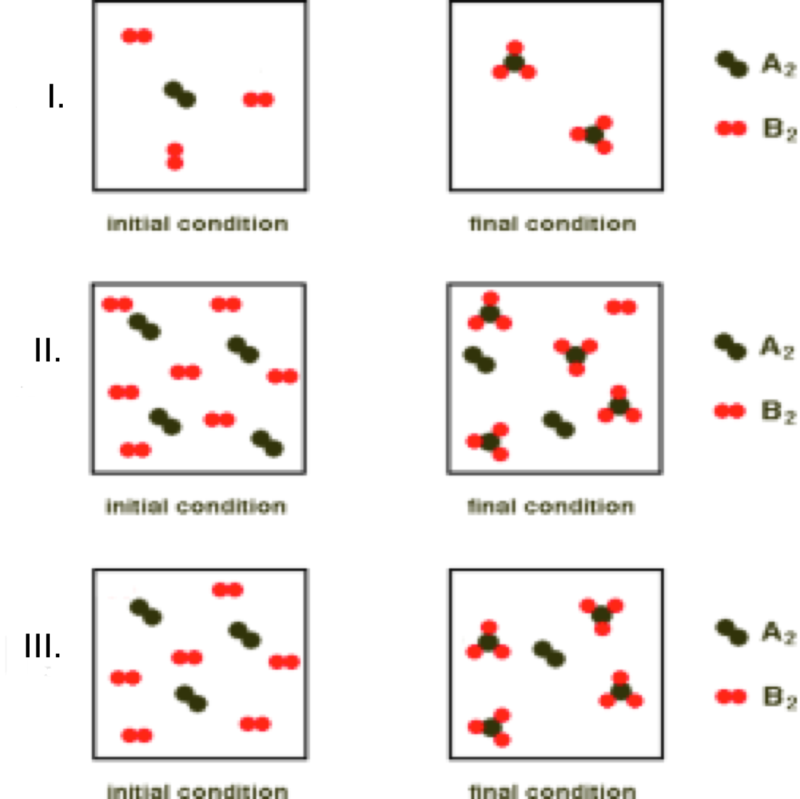 In the figure below are three pairs of containers labeled I., II. and III. depicting the reactants, in the container labeled initial condition, and the products, in the container labeled final condition. b) Write the balanced chemical equation for the reaction depicted as occuring in container II. c) Write the balanced chemical equation for the reaction depicted as occuring in container III. 2. In the figure below are three pairs of containers labeled I., II. and III. 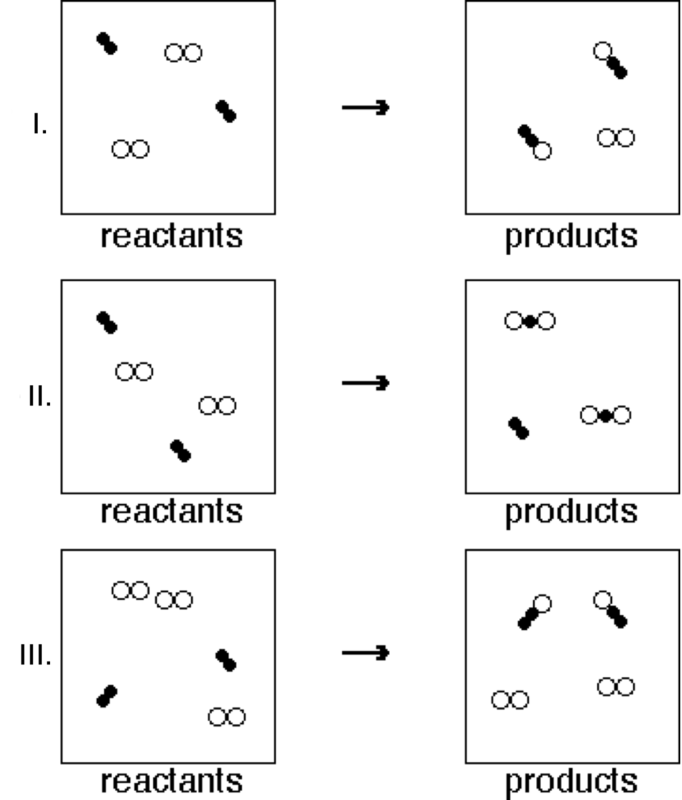 depicting the reactants, in the container on the left, and the products, in the container on the right. a) Do all three pairs of containers labeled I., II. and III. depict the same chemical reaction? b) if your response in 2a above is 'No', identify the containers of the three (I., II., III.) that do depict the same chemical reaction. c) What evidence do you have to support your claim in part 2b. c) If the the 'open' circled diatomic molecule is D2 and the 'filled' circle diatomic molecule is F2, write the balanced chemical equation for the reaction. 3) In the figure below is one pair of containers depicting the reactants, in the container labeled initial condition, and the products, in the container labeled final condition. a) Write the formulas of the reactants depicted in the container labeled initial condition. b) Write the formulas of the products depicted in the container labeled final condition. 4. Is there anything about the questions that you feel you do not understand? List your concerns/questions. 5. If there is one question you would like to have answered in lecture, what would that question be?